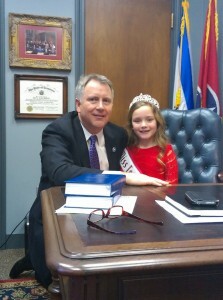 Tennessee Princess Ava Lowe met with Senator Kerry Roberts. 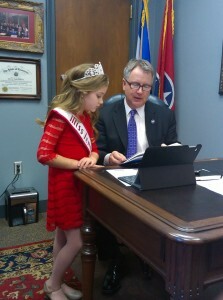 Tennessee Princess Ava Lowe met with Senator Kerry Roberts. 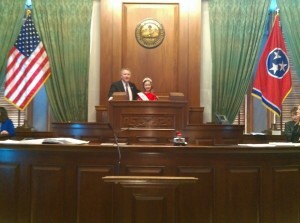 Ava received a special gift from Senator Kerry Roberts before going to Nationals as well as an invitation to be his special guest on the floor of the Tennessee State Senate. 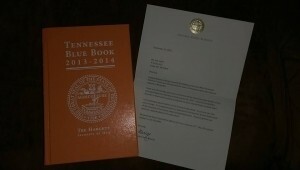 The gift she received was a very special Tennessee Blue Book, the Blue Book is orange because it is dedicated to Pat Head Summit, former head coach of the University of Tennessee Lady Vols basketball team. She visited the Senate floor on January 25, 2016, although she was out of school for a snow day, she definitely got her history lesson in thanks to Senator Kerry Roberts and his wife Diane. She received a wonderful tour of the capital, was introduced on the Senate floor as Senator Roberts’ special guest and she also got to sit in on a committee meeting. 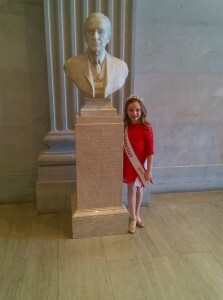 Previous Previous post: South Carolina Princess Saylor Porcaro met with Congressman Mark Sanford. Next Next post: Miss Georgia Pre-Teen Spokesmodel Damácia Howard won the 2016 Prudential Spirit of Community Award!